Screencaps for Ep 1.26 added & Season 1 completed! 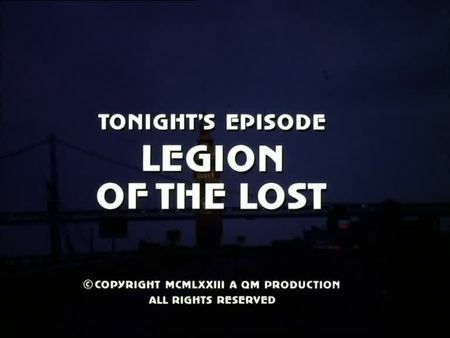 I have finally added the screencaps for Legion of the Lost to the episodes' page. After three bums are brutally beaten to death in a two-week period, Mike Stone goes underover as a tramp. Straying the skid-row streets close to the waterfront, Mike accidentally crosses the night doss of a young rough sleeper, Paul Thomas, who is obviously hallucinating on detox. While Mike is offering a cup of hot coffee, a strong and tall buckler - convincingly performed by Leslie Nielsen - shows up, giving Mike advice to leave his hands off the young man and even better leave the city at all. Mike gets to know the young man's guardian is Jake Wilson, a former professional boxer and now-dry alcoholic, who is somehow related to all the victims, and his investigations finally lead him to an independently-run free doss house called Vera's Place. Following an attempt on Paul Thomas' life, police is taking him to the hospital. Steve finds out that Paul Thomas actually is Paul Cullen, son and heir to the owner of numerous ship yards who passed away two months before. Several other suspects, including Paul Cullen's sister and the manager of his father's company, are soon under investigation. This episode is a rather tough one concerning the exact identification of filming locations. The opening sequence and crime scene was filmed on Osgood Street, a one-way side-road in the infamous red-light district of Broadway, where one of the bums is beaten to death (this side-road also appeared in the Pilot episode). Being undercover, Mike strays along the shabby skid-row part of the waterfront right beneath the elevated Embarcadero Freeway between Mission and Howard Streets, questioning other tramps, and later meets up with Steve on Fulton Street, right in front of Civic Center Plaza and San Francisco City Hall. The doss house, Vera's Place, is located in the Tenderloin on Eddy Street. Concerning the hospital to which Paul Cullen is taken by police, I am pretty sure it is not located in San Francisco at all. The facade looks completely unfamiliar, and the entrance door sign says "Emergency and Outpatients Only - Visitors use General Hospital Entrance on G Street" (there is no 'G Street' in San Francisco, other than in Sacramento, for example). The yacht harbour where Cathy Cullen is trying to sell off her boat to Steve, assuming he was a potential customer, actually is Marina Del Rey yacht harbor in Los Angeles. The Cullen Company's headquarters is located on the former 'San Leandro' ferry which had been converted for residential use in the 1960's and anchored at Pier 37 at the time this episode was filmed (the huge ferry boat caught fire later in the 1970's and was never rebuilt). As a sidenote, and still in act one of this episode, we are taken to Mike's house - just for indoor filming, though. Mike just returned from a fishing trip, so Steve is briefing his partner on the killed tramps, and is getting excited over Mike's new electric shaver.